I know I know, you thought I was done with the guest posts! But...life got a little overwhelming so my wonderful friend Erin (AKA The Spiffy Cookie) stepped up and volunteered to share a little something with you guys. I've guest posted on her site before so I'm so happy to introduce this super fun, former Buckeye (she still loves chocolate and peanut butter, though! ), wonderful blogger/cook/baker to you again! And look! Erin brought ice cream! With pb! and marshmallow! HOORAY! Hello again Cooking Actress readers! Erin here from The Spiffy Cookie giving Kayle a break from blogging while she plans for her upcoming wedding. Kayle is such a wonderful person and I couldn't be happier for her. She and Michael are the cutest! I was lucky enough to meet her in NYC last year but now that she has moved back to Ohio I really need to pay her another visit, especially since she lives in the same town as some of my other friends. 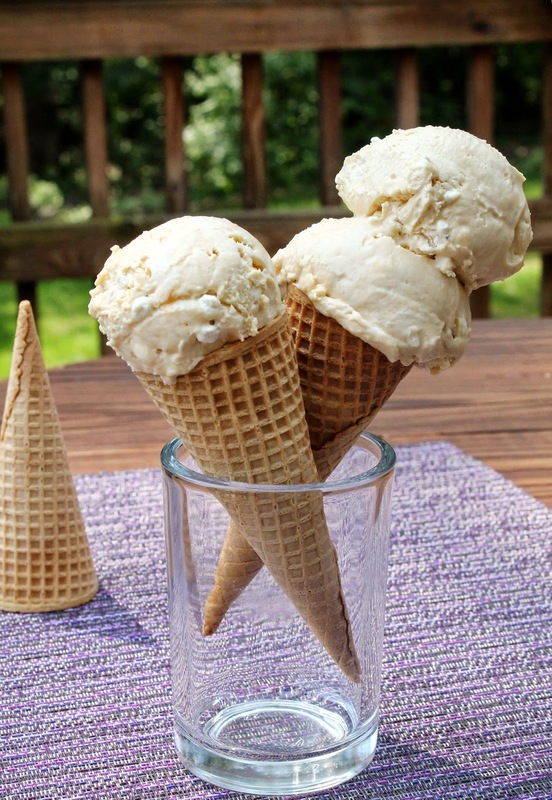 Today I am sharing a recipe for my new obsession, no-churn ice cream. 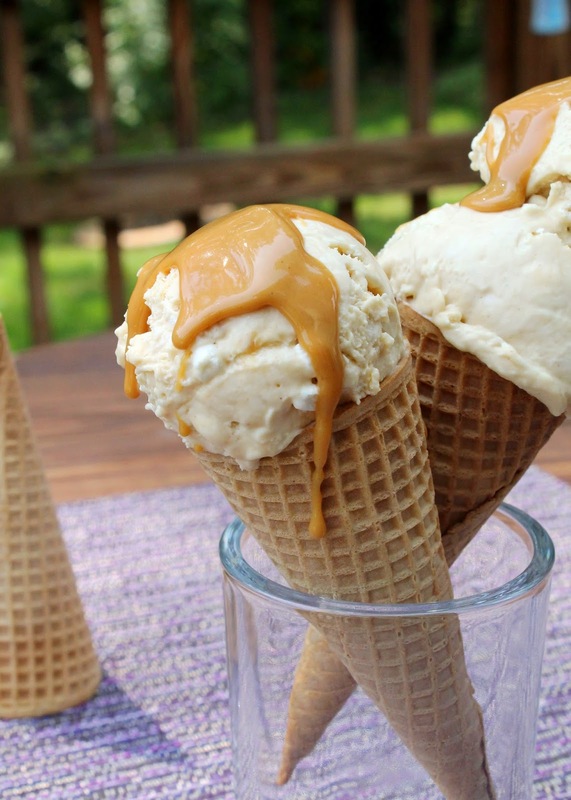 This recipe is so easy and delicious it almost makes ice cream makers obsolete. All you need for the base is 1 pint of heavy cream and 1 can of sweetened condensed milk. The churning aspect of ice cream is substituted by whipping the heavy cream with an electric hand mixer. Fold in the sweetened condensed milk and any other flavor additions and it's ready for the freezer. But of course you already knew all of that since Kayle has shared an extensive list of easy no-churn ice cream flavors. Normally the hardest part of making no-churn ice cream is deciding on a flavor. I did ponder whether or not a browned butter ice cream could be possible since Kayle is the browned butter queen but thankfully Kayle is as much of a peanut butter lover as I am which made the decision much easier. After discovering the magical results of adding marshmallow creme to no-churn ice cream I went with fluffernutter ice cream, complete with marshmallow bits and a magic peanut butter shell. 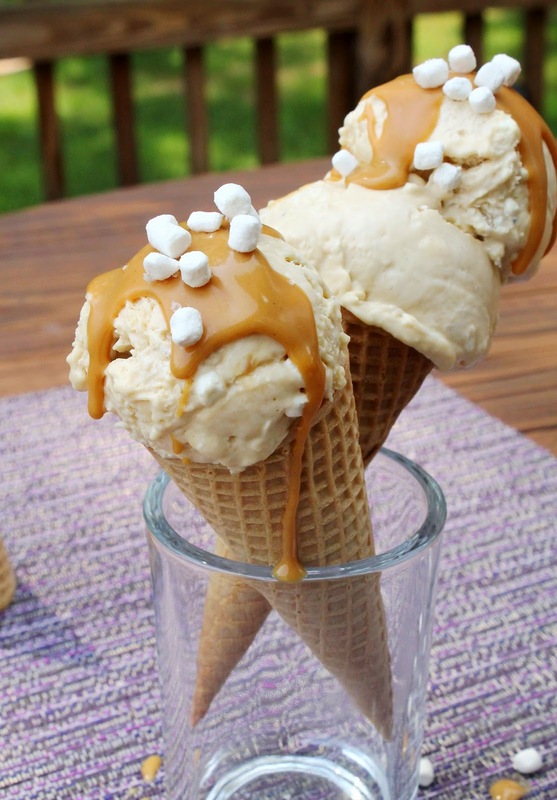 Ice cream adapted from Spiffy Cookie's No-Churn S'mores Ice Cream. Shell adapted from Nutella Magic Shell. Makes approximately 1-1/2 quarts ice cream. In a large, chilled bowl, whip heavy cream to stiff peaks. In a separate large bowl, mix together the sweetened condensed milk, peanut butter, and marshmallow creme. Using a rubber spatula, gently fold in 1/3 of the whipped cream into the sweetened condensed milk mixture. Gently fold in remaining cream until fully combined. Fold in the marshmallow bits. Pour ice cream into a loaf pan or freezer-safe container, wrap with plastic warp or tin foil and freeze for 6 hours or overnight. When ready to serve, make the magic shell. In a small bowl, melt the butter. Whisk in the peanut butter until smooth then allow to cool for a few minutes. Drizzle over ice cream and watch it harden. This ice cream was DEF a good call! Totally craving some now! Thank you SO MUCH Erin! Guys, be cool, follow her.